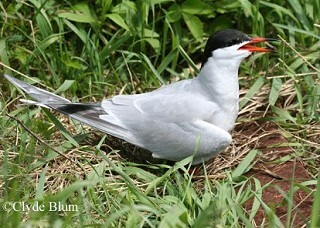 The Common Tern is very similar in appearance to the Forester's Tern, which is the more common visitor to Tennessee. 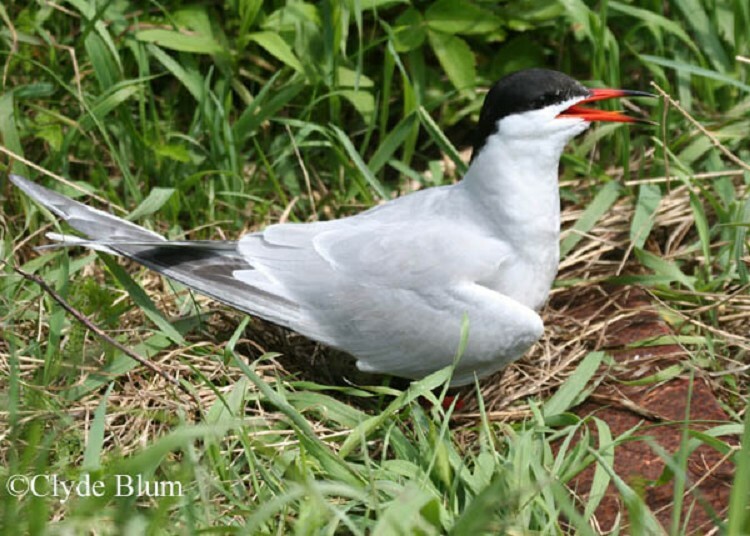 The Common Tern is a graceful bird and the most widespread of the North American terns. It breeds in temperate and sub-Arctic regions of Europe, Asia, and eastern and central North America, and during the non-breeding season the North American birds are found from southern North America to Ecuador and Brazil. Tennessee records are primarily from mid-April to mid-May, and late July and early October. Description: This medium-sized tern is pale gray above and white below, with a long deeply forked tail, and dark-tipped, pale wings. In breeding plumage (April-November) the bill is orange-red with a dark tip, the head has a black cap, and the legs are red. In non-breeding plumage (October-March) the bill is black, the black cap is only on the back half of the head, and the legs are dark. Immature birds (August-November) resemble winter adults, but have darker primaries. Forster's Tern is difficult to separate from the very similar Common Tern, especially in the fall. In breeding plumage, the Forester's has a more orange bill, and whiter wings, and a longer, more forked tail. In non-breeding plumage the black cap is reduced to a black patch on the side of the head. Habitat: In Tennessee, found along lakes and rivers. Diet: Primarily small fish, some invertebrates. Nesting and reproduction: There are no records of this species nesting in Tennessee. Status in Tennessee: Uncommon migrant, and rare summer visitor across the state. Tennessee records are primarily from mid-April to mid-May, and from late July and early October. 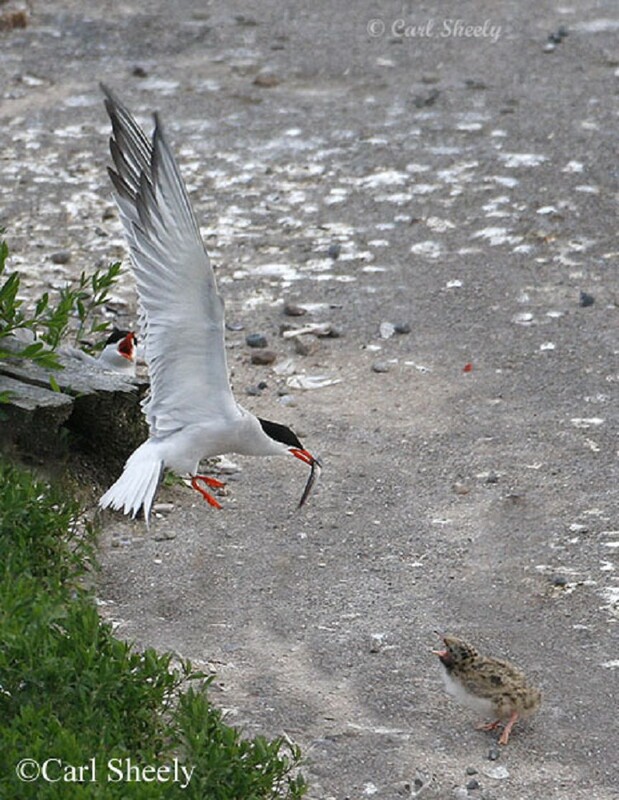 The oldest known wild Common Tern lived to be more than 24 years 11 months old. The Common Tern is able to drink both salt and fresh water. Like many seabirds, it has nasal glands that excrete the excess salt. It drinks mainly on the wing, gliding with raised wings, repeatedly dipping its bill into the water. Best places to see in Tennessee: Most likely to be seen along lakes and rivers, in all regions of the state. Nisbet, I. C. T. 2002. Common Tern (Sterna hirundo). The Birds of North America, No. 618 (A. Poole and F. Gill, eds.). The Academy of Natural Sciences, Philadelphia, PA, and The American Ornithologists' Union, Washington, D.C.